Made from an original blend of herbs & spices, Knorr Aromat enhances the natural flavour of foods. Salt, Permitted Flavour Enhancer (E621, E635), Cornflour, Lactose (Milk Derivative), Hydrolysed Vegetable Protein, Onion, Palm Olein, Silicon Dioxide, Spice, Celery Seed. All food additives used are from plant and synthetic origins. May contain traces of cereals containing gluten, soy, egg, fish, crustacean, mollusc, peanut and tree nuts. *Based on Grossopanel AG Switzerland, dry seasonings market share, 2011, as at March 2012. 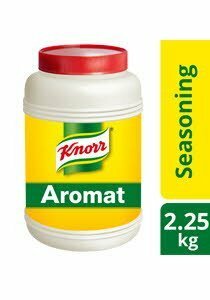 For Marination: Add 12g (1 tablespoon) of Knorr Aromat for 1kg of meat. For Broth: Add in 9g (3/4 tablespoon) of Knorr Aromat in 1L of water.